AAA says the vehicles drifted out of lanes and hugged lane markers, struggling with moderate traffic, curved roads and streets with busy intersections. Three of the four would have failed to avoid a crash when the vehicle ahead of them changed lanes and a simulated stopped vehicle was ahead. "As a result we had to take evasive action," said Brannon. 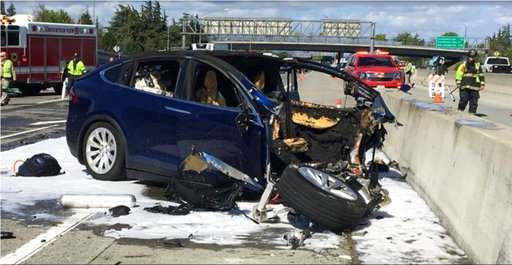 Only the Tesla system brought the vehicle to a complete stop in all five track test runs, but driver intervention was needed for the others, the AAA report said. These systems are dangerous. Drivers who are not in control cannot be expected to take control effectively when the systems fail. No dog, religion is dangerous. In contrast these systems are far safer than humans who regularly fail to keep vehicles in their lanes or spot stationary objects in time to avoid a crash. And then you have 'assist' tech that is too smart for its own good. Our car's front parking sensors doubled as driving proximity detectors. The system would grumble about tail-gating. It would autonomously apply the brakes if its alerts were ignored. In extremis, it would do an emergency stop, faster than any human driver's reactions. Upside, it would spot bicycles, pedestrians etc, potentially mitigate mishap. otto is right. (wow! how often do I get to say that?). Automation is more reliable than Human's directly controlling the dangerous machinery. Of course that is pretty low bar to leap. Tens of millions of years of monkey instincts have left a dubious influence on Human intelligence. Where otto & I differ on this issue? Is his belief that the automated machinery will some how make a miraculous leap to an autonomous intelligence of self-directing evolution. I disagree. I am of the opinion that the all-too-fallible Humans involved with creating & developing & producing the Artificial Stupids, will achieve a whole new level of Natural Stupid! I cannot believe that the people involved & the acronym agencies skulking around in the shadows, will ever willingly give up their power of command & control. otto, if I have misstated your position? Please correct me.